♥ A Donna Wilson 2013 calendar. ♥ A Paperchase 2013 diary. ♥ A little stack of five metallic washi tapes. To enter just leave a comment below and be a follower of scraps of us. I am happy to post worldwide and the closing date for the giveaway is 10th Dec. 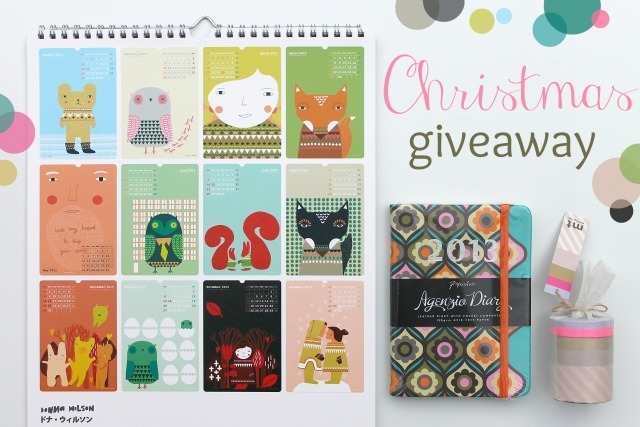 The winner will be picked at random and announced on my blog on the 11th Dec.
Oh yes please! I love the calendar, why didn't I spot that when I was looking at the Donna Wilsonn site for potential Christmas pressies for myself? If I dont win, it's going on my wish list. I want!!! From Argentina, yeaaaaa!! You can count me in! Gorgeous calendar. that calendar is so super cute!! this is a great giveaway! i love the calendar & i am an addict for planners/diaries. thanks for the chance! Count me in lovely! It's all fab! Thanks! I'm sure that I found a lot of inspiration in your blog. I want!!! From Argentina too! I'm following you now!!!! Nice blog! First time visiting your blog and loving it! I follow you now and please count me in this awesome giveaway! Oh, everything is sooooo nice! I am following you from spain. asi que para empezar bien me quedo...y te sigo ya que estoy me anoto!!! oh my, those things are gorgeous. I want to win! Hola!, llegué gracias a Lau!.. morí de amor con tus fotos!. Love everything, including your blog! Hi! congrats for your blog! This is a great giveaway!! I want everything!! I love it all! The perfect christmas present! I want this beautiful present now!! I can't think of anything witty, so will just say Pleeeaaaase, lol! So beautiful! Thanks for share with your followers. Lovely things :) Please put my name in the giveaway hat, I've been reading for a while and have now followed too. Hello from Spain. You have a nice blog! I Love this blog! and the giveaway!! Beautiful things! I would love to have them! Very nice stuff, I like to participate in the contest. ¡Thank you for your generosity! que lindo!!!!! yo los quiero jajajajajjj, muchas gracias por el sorteo! Beautiful blog!!! i want this presents!! Que hermoso!! quiero participar, hermoso tu blog! !